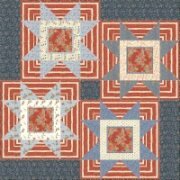 This pattern is a simple star made from half square triangles. Makes a great gift because it is so quick to make. Works well in any color scheme -- Christmas, elegant, bright, batiks, etc. 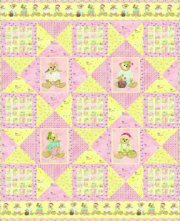 The size makes it great for a wall quilt, a table topper, baby quilt, or small throw. 40" X 40"
Konda learned how to sew in 4-H and home economics. She started out with pants that didn't fit and a sweatshirt with a stretched out neck. It got better from there. Konda made her first quilt in high school. 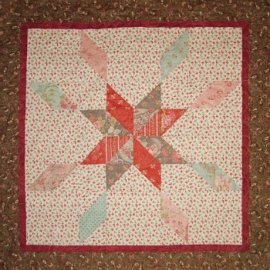 She said, "I heard that to make a quilt, all you had to do was sew squares into rows and sew the rows together." She loved the quilt despite the fact that none of the squares matched up. From there, Konda went on to become a math teacher and start a family. As many do, Konda came back to quilting when she was expecting her first child. 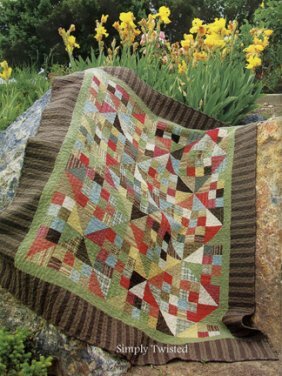 She credits a neighbor for igniting her passion for quilting. That same neighbor also introduced her to the long arm sewing machine, and she was hooked. Konda Luckau and her family moved to Payson the summer of 2002. That fall Konda started her long arm quilting business, Moose on the Porch Quilts. 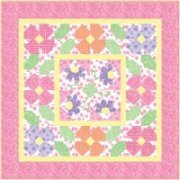 A few years later, she published her first pattern book, "Simply Charming," that contained 8 patterns based on 5" charm squares. Her newest book, "Simply Charming Kids," became available this past June. 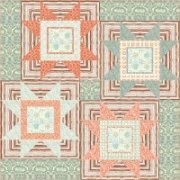 Konda is also active in the quilting community. She has been the chairman of the Peteetneet Quilt Show (www.moosequilts.com/quiltshow) in Payson for 6 years and has participated in the Quilts of Valor (www.qovf.org) program for about that long as well. Her patterns have also recently debuted at the Moda Bake Shop (www.modabakeshop.com). 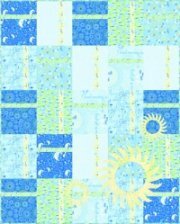 Also recently, Konda started up a successful Jelly Roll Sampler Quilt Along on her blog. She has brought 12 designers together to create a free block of the month type program. Hundreds are participating through her blog, and many are continuing to join. 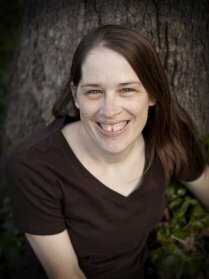 I was a math teacher for several years and turned to quilting as a business as a way to stay home with my children. My favorite pattern is often the one I am currently designing. 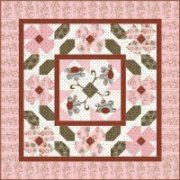 One of my favorite quilts is the first charm pack quilts I designed. I wanted a plaid quilt. I liked other plaid quilts that I saw, but I had trouble when I tried to pick out fabrics for a plaid quilt. I purchased my first charm pack, Moda Chocolat Wovens. After I designed the quilt, I told myself that I wasn't going to judge the quilt until it was washed. The entire time I was sewing it together, I didn't like the quilt. I thought for sure it was going to look dreadful. 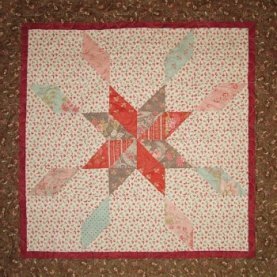 When I finished, however, I loved the quilt. I still love the quilt. That is what got me hooked on charm packs. 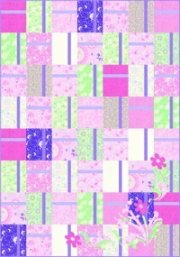 That is also when I started publishing quilt patterns. Growing up I participated in team sports in high school. In between having children, I have tried to pick sports back up again. Last year I discovered triathlons. I have really enjoyed participating in triathlons and 5k races. Each race feels like a celebration of life. Everyone who finishes is a winner. For many years, I shared a bed with one of my sisters. We slept under a quilt that was made by one of my grandmothers who passed away when I was 3 years old. It was a trip around the world. How I loved that quilt. I loved the colors and the pattern. I have 6 children, 1 boy and 5 girls, ages 7 months to 11 years. My husband and I both grew up in the Army. We have lived in Utah all our married life. Some days we both still think it is time to move. Do you like Konda's designs?